TonTek Records is on a role with there 17th release. 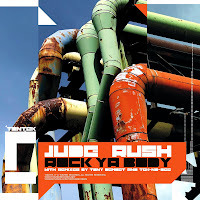 This release is full of amazing tracks by Jude Rush and remixes Tek-No-Bee and Tony Demoet. This release comes at you proper with some funky techno for the masses. Jude Rush serves up this tribal monster with big chunky, funky tribal loops, subby basses and some great piano’s rifs. Don't forget to check out the great remixes by Tony Demoet and Tek-No-Bee.